Are you missing teeth and missing out on life because you are reluctant to go out in public? It’s hard when life is going on all around you and you feel too embarrassed to be a part of it. At The Lodi Dentist, they want to do all they can to help you get your smile restored to you and find what denture style you need. There is no reason to miss out on life because you are afraid to smile. Our office and team, serving the Stockton and Galt areas, are here for you. Which Denture is Right for Me? Traditional Full Dentures — Traditional full dentures are a custom made apparatus that gives you a set of false, very natural looking teeth. These are adhered to your gums with adhesive and are removed when you sleep or when you want to clean them. You can have full dentures, which are one appliance for your upper teeth and another appliance for your lower teeth. Partial Dentures — A partial denture apparatus is one that is used for a few teeth that are side by side. It isn’t adhered to your gums like full dentures. This denture is clipped onto dental crowns that are on each side of the denture apparatus. This denture option is very convenient and is easy to clean. This denture looks, feels, and functions just like your original teeth. Implant Supported Dentures — Dental implant supported permanent dentures are the most long-lasting, durable denture option. Dental implants are a remarkable restorative dentistry treatment that places a small metal rod where you have a missing tooth that basically replaces your original missing tooth root. On top of the implant, a dental crown is placed. Permanent dentures are then attached to the dental implants. These permanent dentures don’t need to be removed daily and are not adhered to your gums with adhesive. They are simply attached to the permanent dental implants and look, feel and function like natural teeth. All-on-Four™ Permanent Dentures — This system, amazing though it may seem, gives you a full set of permanent dentures in a 24-hour period. It may sound impossible, but the dentures are fitted on dental implants and you can have a full set of teeth in 24 hours! 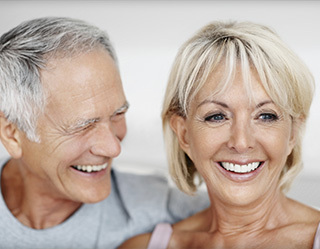 If a denture apparatus or dentures are something you are interested in, call us today! Serving our patients in Lodi near Galt and Stockton.